CFQ has been developed by Qigong Master Yap, a remarkable man who has spent 60,000+ hours in meditation, this process brings deep healing and relaxation to it’s practitioners. CFQ is simple enough that the essential principles can be grasped in minutes and profound enough that the practices can be refined and perfected over years. The long lasting effects of CFQ occur because of the movements, and the principles behind them, have been refined over time with endless practice by Master Yap. The practice has produced a system whereby practitioners develop an ability to prevent, minimise and eliminate issues of disease. The CFQ practice system was developed by Master Yap to be open to everyone, free from any delineation of faith or religion. Where the ‘individual’ is given access to develop there own insights into life and its meaning through CFQ’s spiritual healing and enlightenment methodologies. 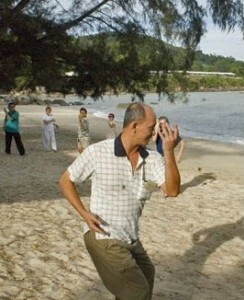 Freeing themselves from disease by concentrating on the principle of ‘letting go’ that is central to Qigong. Master Yap’s work is proven evidence that through spiritual realization the link to suffering can be broken and real peace can be achieved. This is true to the founding values and principles of Qigong, back to the times of Confucius and Lao-Tsu, founder of Taosim (c. 600BC) and gives a clear example of Master Yap’s teachings and practice being an accurate modern interpretation of ancient beliefs. The success and quality of Master Yap’s teaching is evidenced in the way they are being presented and followed around the world. Qigong Master Yap and CFQ Practitioners. Yvette Best has studied with Master Yap for over 12 years and has attained successive gradings in the practice of CFQ, she is now certified to teach Level 1 and 2 in CFQ. Master Yap actively encourages the community of CFQ pracitioners to work together to further the benefits of CFQ for all, details of the CFQ UK Network can be found at cfq.org.uk. Contact Yvette on 07973 638050 to find out more about the CFQ community as a whole.